It basically exists only to troll your body. We all know "springing forward" for Daylight Saving Time is awful because we lose that precious hour of sleep on a Saturday night (so, so cruel). Unfortunately for humanity, that's not the biggest downside of the hour time-shift we experience each spring: it also immediately and significantly ups the heart attack rate. Well, you can, but you'll just be really confused for a week. Even though we've been living this way for the past 6 years, it seems some people are confused about when Daylight Saving Time starts in North America. See, it's different, depending on what side of the Pond you live on - so ignore your British friends, and remember: we don't set our clocks back until next weekend. Time zones don't bother us too terribly much in our everyday lives -- in fact, they make a lot of sense -- except when people fly across the planet and appear to arrive before they left. Or when folks in California complain about their New York friends spoiling the ending of the latest The Walking Dead episode because they saw it three hours earlier. 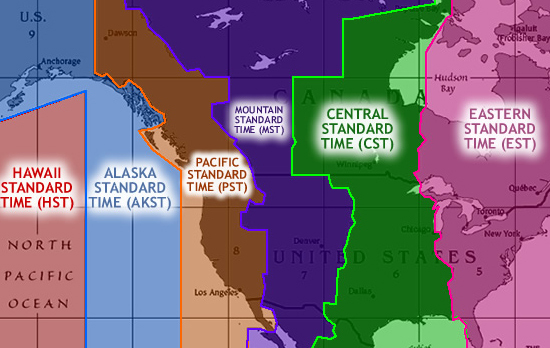 But did you know time zones have been around in the U.S. for less than a hundred years? That's right. On this day in 1918, Congress gave us our time zones and established the much-vaunted, yet often-ranted-about daylight saving time.